Product description: Foodchow is an online food ordering system and mobile app available for restaurant owner to make online food order processing allowing restaurants owner to make food ordering process more flexible. Are you a Restaurant Owner ? List your restaurant for free and start taking online food ordering without any upfront cost. No need to take orders over the phone. Allow your customers to place orders through website an mobile app. We are an expert in Hospitality and digital marketing. Contact us today to find out how we can help you to grow your restaurant. FoodChow has an Innovative food ordering app available on iPhone and Android. You can find nearby Restaurants and place order by viewing Restaurant Menu. The App helps you to take you to the Restaurant you like to visit through GPS, as well as share your experience by giving your own review and rating. Join the Fast Growing Portal where you can Promote your Online Digital Menu and Restaurant Website without any cost. 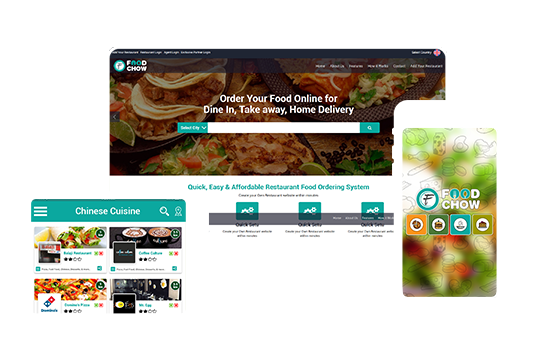 Foodchow is leading Online Food Ordering portal. We provide own Online Food Ordering System to Restaurant Owners. Customers can order food with their Smartphones or through Foodchow Website. Discover Best Restaurants in India by viewing their Menus, Customer's Reviews & type of Cuisines. © 2016 Foodchow. All rights reserved.